Mouthwash makers say that mouthwashes are full of health benefits, while some people worry that rinses containing alcohol could pose risks. 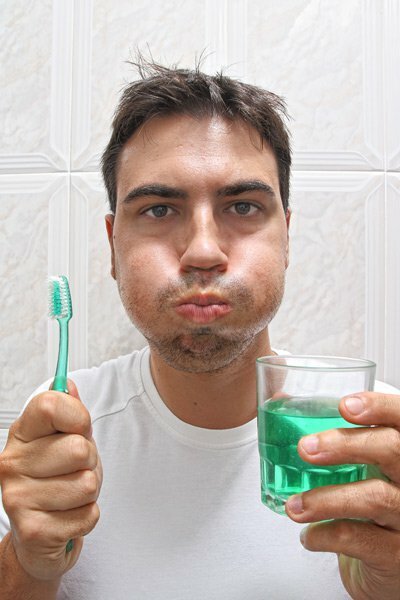 Mouthwashes clearly provide some benefits, such as fighting gum disease, cutting down on cavities, soothing canker sores, and even safeguarding pregnancies. One downside, however, is that rinses can merely mask bad breath, which is often the result of poor hygiene. “If a patient has poor oral hygiene and doesn’t brush effectively, there is no amount of mouthwash that can mask the effects of poor health. Just using mouthwash would be equivalent to not bathing and using cologne to mask the smell,” says Nicholas Toscano, DDS, a diplomate of the American Board of Periodontology, and co-editor-in-chief of the Journal of Implant and Advanced Clinical Dentistry. Even though mouthwashes can be helpful in lessening the risk of periodontal disease and cavities, they should always be used in conjunction with good hygiene habits. Read the full article in Everyday Health by clicking HERE.